Over the weekend, as the Trump administration struggled to explain its position on Syrian president Bashar al-Assad, Russia and Iran reaffirmed their support for his regime. In a statement released by their joint command center in Syria, the Assad allies called last week’s United States missile strike in Homs province “a crossing of red lines.” The statement continued: “From now on we will respond with force to any aggressor or any breach of red lines from whoever it is and America knows our ability to respond well.” What exactly that response might look like was unclear. 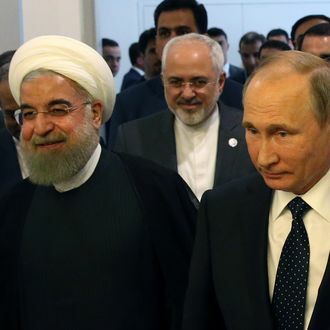 Russian president Vladimir Putin and Iranian president Hassan Rouhani also spoke on the phone over the weekend. According to the Kremlin, the two leaders agreed that the U.S. had acted “in violation of international law” and called for an investigation into “the chemical weapons incident” in Idlib province that prompted the strike. Though the consensus is that Assad was responsible for the sarin gas attack, Russia — which spearheaded a deal to eliminate Syria’s chemical arsenal back in 2013 — has tried to shift the blame to Syrian rebels. In their brinkmanship over Syria Western elites try rewind situation back to August 2013 (no more talk of investigation).What are the goals? If yesterday's statement by @BorisJohnson to be trusted,RTillerson will deliver G7 ultimatum to Moscow next week.What are probable outcomes?